On Wednesday, February 28th we had a party at the school for Mrs. Roche. We had this party because it was her last day in Gortskehy School. We all made cards and bought her a gift which made her very happy. Mrs. Roche invited a clown who performed magic tricks and painted our faces. She was very good and we all had great fun. On Friday evening we had a Mass at Carras Church for Mrs. Roche and her family. 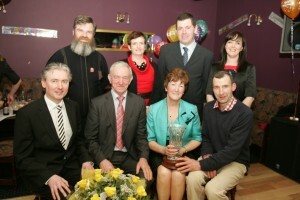 Everyone took part in the ceremony and then we went to Tierney’s of Foxhall where we had a party. A band played music and we had sandwiches, cake and lemonade. It was great fun. We will all miss Mrs. Roche and we wish her good luck in the future.